Where else can you find Dell Curry, Doc Rivers, Bill Cowher, Crazy Towel Guy, and Santa Claus all in the same place but at Cameron Indoor Stadium? For a non-conference game against a mediocre Colorado State team during the height of finals season, there were a fair share of celebrities in attendance. After last week’s loss, Duke needed to respond, and respond they did. 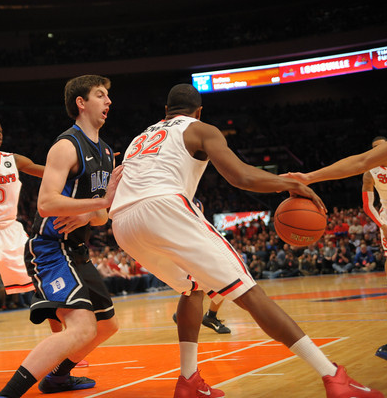 The Blue Devils returned home to Cameron for the first time in almost three weeks and trounced the Rams 87-64. As examined in yesterday’s column, Coach Krzyzewski responded to last week’s blowout loss by making a lineup change, inserting Tyler Thornton into the starting lineup to replace struggling junior Andre Dawkins. Not only did this illicit a response from the team, but no one responded by stepping their game up more than Dawkins himself. Dawkins looked unstoppable on the floor, knocking down 6-of-8 shots for 15 points in just 12 minutes before taking a hard fall near the end of the first half and sitting out the second half with back spasms. But for the time he was on the floor, Dawkins looked unstoppable, drilling threes with reckless abandon and capping off fast breaks with huge dunks. I think the role of coming off the bench suits him more because he has often struggled to create his own shots. Being this team’s sixth man will alleviate much of that pressure. Dawkins has been so streaky throughout the year that it seems as though you can tell whether or not he’ll be a factor in the game after his first five minutes on the floor. You could tell being knocked out of the starting lineup gave him a little extra spark, and his energy was electrifying in the short time he was on the floor. Seth Curry struggled shooting from the floor against Ohio State, and he was the only Duke player who genuinely struggled shooting the ball against Colorado State. But unlike in the Ohio State matchup, Curry was able to make himself useful on the floor even though he wasn’t knocking down shots. Curry is starting to look more and more comfortable distributing the ball as he notched eight assists on Wednesday night, the highest single-game assist total by any Blue Devil this season. After last week’s debacle in Columbus, you can be assured Duke focused on controlling the paint at practice this week, and that is exactly what they did. Miles and Mason Plumlee each turned in one of their best performances of the season. For Mason it seemed a bit more business-as-usual, contributing 14 points on 6-for-7 from the floor to go along with 10 rebounds. He really took advantage of the undersized Rams on the defensive end, amassing five blocks and four steals on the contest as well. Mason also had one of the highlights of the game when he soared down the lane to throw down a monstrous dunk over a Colorado State defender in the game’s opening minutes. Miles got himself a bit more involved on the offensive end than we’re accustomed to seeing, adding a season-high 14 points of his own with five rebounds and three blocks. Both Plumlees showed off an array of post moves and showed no fear on the defensive end. Austin Rivers’ 17 points on 5-of-9 shooting doesn’t look like anything spectacular on the outside, but it made me really excited on the walk home from Cameron. This was the first game, in my opinion, where Rivers never stuck out on the offensive end of the floor. He didn’t force shots, he didn’t turn the ball over, and he blended in perfectly. He is truly beginning to fit into this system. Sometimes with great players it’s not what you see, but rather what you don’t see. To be able to practically forget about Rivers and watch him rack up those kind of numbers is exactly what shows how scary good this guy is. Josh Hairston only contributed four points and three rebounds in his 14 minutes of play. This wasn’t his best game of the year, as he was certainly exploited on defense (something that rarely happens) on more than one occasion. However, I do believe this dunk, which was only good for #5 on DukeBluePlanet’s top plays from the contest, speaks for itself. Although Coach K’s most noticeable adjustment might have been the insertion of Thornton into the starting five, I believe the most important change might have been Krzyzewski’s utilization of a deeper bench. Coach K has typically stuck to an eight man rotation throughout the year, but last night’s game featured 10 Blue Devils all playing double-digit minutes, with only freshman Michael Gbinije’s minutes coming in garbage time. Duke used this game as an opportunity to try a bunch of different sets, and was not afraid to sub three or four players out at a time, even early in the game. This deeper bench shows that Krzyzewski is becoming more confident in his younger players to take on more significant roles, something that will be crucial with ACC season quickly approaching. All in all it was just what we expected. Duke shot the ball incredibly well and was able to dominate a physically inferior Colorado State team on the inside. They adjusted their rotation and were able to respond from a tough loss with a convincing win, and there were definitely some promising performances from role players that will hopefully be replicated in the near future. However, we need to keep in mind who we were dealing with. Colorado State is a .500 team that has lost to the likes of Stanford, Southern Missouri, and Northern Iowa, none of whom you’ll see come close to cutting down the nets in March. Our next matchup against a Washington who pushed #11 Marquette to their limit at Madison Square Garden will tell us a lot more about the direction in which this team is going. Hopefully our newfound momentum carries through. Until then, stay Crazie, my friends.